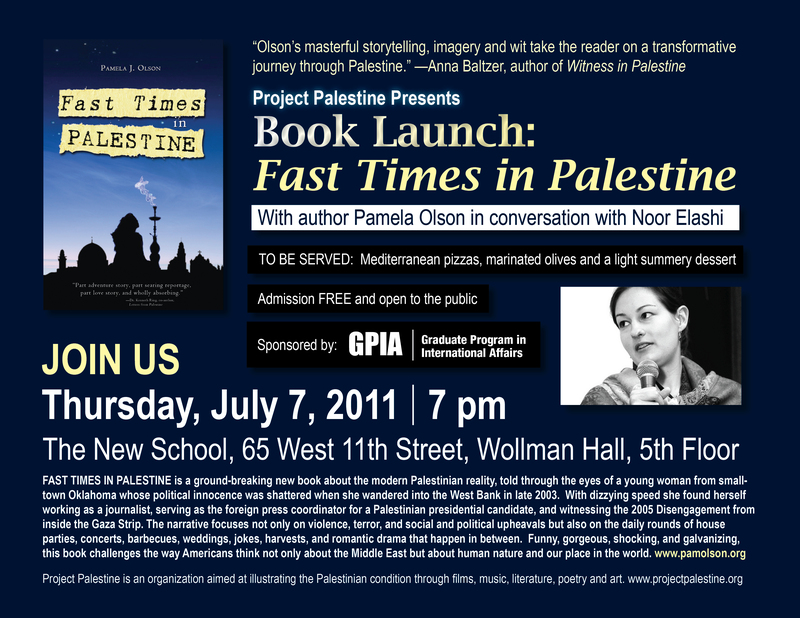 Join me and host Noor Elashi for the OFFICIAL BOOK LAUNCH of Fast Times in Palestine! The program will include a presentation, interview, readings, Q&A, book signing, lots of laughs, and FREE Mediterranean Food (including mini-musakhan, my favorite Palestinian dish). To read Chapter One of Fast Times, click here. To purchase the book on Amazon.com, click here. To purchase the eBook on Amazon Kindle, click here. To purchase the eBook for iPhone or iPad will full-color photographs, click here. Paperback is $14.95, eBook is $5.99 — 20% of all profits from the book in June will go to the US BOAT TO GAZA campaign. FAST TIMES IN PALESTINE is a ground-breaking new book about the modern Palestinian reality, told through the eyes of a young woman from small-town Oklahoma whose political innocence was shattered when she wandered into the West Bank in late 2003. With dizzying speed she found herself working as a journalist, serving as the foreign press coordinator for a Palestinian presidential candidate, and witnessing the 2005 Disengagement from inside the Gaza Strip. The narrative focuses not only on violence, terror, and social and political upheavals but also on the daily rounds of house parties, concerts, barbecues, weddings, jokes, harvests, and romantic drama that happen in between. Funny, gorgeous, shocking, and galvanizing, FAST TIMES IN PALESTINE challenges the way Americans think not only about the Middle East but about human nature and our place in the world. So we finally have a date and a venue nailed down for Fast Times in Palestine‘s official New York Book Launch. The place: The New School’s Wollman Hall, near 12th St. and 6th Avenue in Manhattan. It’s a bright, gorgeous space with big windows and a baby grand piano. The event will be hosted by Project Palestine, and the brilliant and talented Noor Elashi will be the emcee. Best of all — there will be FREE Mediterranean Pizza, including vegetarian cheese and zaatar pizza and musakhan pizza with roasted chicken, sauteed onions, sumac, and slivered almonds — divine. And a special summery dessert. Mark your calendars — details coming soon! Another outtake from the book. I wrote the following during an Israeli attack on the Gaza Strip called Operation Days of Penitence in the fall of 2004, born of my deep frustration and disillusionment at the time. It was roughly ten percent as horrifying as Israel’s 2008 attack called Operation Cast Lead. “Only” about 140 were killed (mostly civilians) instead of 1,400 people killed (mostly civilians). Both were disproportionate and ineffective retaliations for Palestinian resistance, which itself is a retaliation for Israel’s occupation, theft, siege, and brutality. And round and round we go. TEL AVIV – Israeli Prime Minister Ariel Sharon has announced a plan to remove what he sees as a proven threat to the health and security of the Israeli people. “I bring you greetings from Jerusalem, the eternal capital of the Jewish people for the past 3000 years, and of the State of Israel for the past 56 years and forever,” Sharon said on Israeli national television. “Let me make one thing clear: the Israeli people will not negotiate with terrorists. We shoot them in their homes and schools, bomb them in their cars, vandalize their places of work, isolate them in ghettos, restrict their movement, comandeer their land and water sources, and destroy their homes and ministries. “And still,” he added solemnly, “any child can simply walk to the street, pick up a stone, and become a terrorist. “So,” he concluded, “the rocks must go. “It will be a major operation, as Judea and Samaria are liberally littered with stones. And every home we destroy only creates more jagged, throwable objects. But they have been using these weapons against us for too long. Donald Rumsfeld said in a press conference in Arlington, Virginia, “I agree with Mr. Sharon. We must act decisively, and we must act now. Their methods are getting more sophisticated. Their aim isgetting better. Their range is getting longer. “We must end the threat to the Israeli people emanating from Judea, Samaria, and the strip of land where Jonah allegedly washed up after being eaten by the whale, now home to more than a thousand Israeli families,” said UN Secretary General Kofi Annan. “And a million or two other people,” he added diplomatically. On Saturday Colin Powell said gravely, “We know the stones are there. We’ve seen the mountains and caves where the stones literally fall out of cracks in the earth. And we have credible intelligence that they may be smuggling these stones into Syria and Iran. The Pentagon urged Israel to engage in a comprehensive unilateral invasion of the Arab strongholds using tanks, Apache helicopters, and F-16 fighter jets in order to impose complete military occupation upon the territories currently occupied by the Arab terrorists before they can develop more sophisticated sling technologies which could affect innocent Israeli civilians at a range of up to thirty feet. Pentagon officials were reported “extremely pleased” to find out that Israel not only had already done so, but also has built walls and checkpoints that make life almost entirely unlivable for many of the Arabs, who call themselves ‘Palestinians’ and occupy the land restored to Israel in 1967. “We think we about have this terrorism problem licked,” confided a top Pentagon official on condition of anonymity because he wasn’t qualified to speak about anything. “You know those refugee camps they have all over the place? We think this is where most of the terrorists come from. Which is extremely convenient, you see, because these people are packed in like sardines and almost completely helpless. “It’s like shootin’ fish in a barrel,” he chuckled. “They can throw stones for a day, a month, until death. They can throw and throw until they get tennis elbow. We will ward off this threat and it will be as if it never happened,” said Tzahi Hanegbi, Israeli minister for internal security. “God made stones for building walls and sniper towers, not for throwing,” he added knowingly, brandishing a chain and winking. “We will kill them even in their outhouses,” said Russian President Vladimir Putin, but it was later discovered that he had misunderstood the question and, unlike everyone else, was still talking about Chechnya. When asked for a statement, U.S. President George W. Bush shouted, “The people of Ireland must be made safe for freedom, democracy, and sover’nty,” from the back of an all-terrain sport utility golf cart on his expansive ranch in Crawford, Texas. “The time for diplomacy has passed,” he added later over Pabst Blue Ribbons and Colombia’s finest blow. “The Pomeranians must be punished. These nukular rocks will be found, make no mistake. And when they are, we’ll bring freedom and peace to the Palefornians, and democracy, and liberty. Here’s another mini-satire I wrote in the summer of 2006 after Israel assaulted Lebanon in another disporportionate and ineffective campaign of brutality that killed about as many innocents as Operation Cast Lead and hammered an entire country’s infrastructure — bridges, roads, schools, homes, factories, the airport, a fuel depot (which cause a horrific oil spill in the Mediterranean), and on and on. To summarize the point: Imagine if Northern Irish militants raided London and killed four British soldiers and captured two, and in response Britain bombed Irish civilian areas and infrastructure from north to south including villages and suburbs, roads, bridges, ports, Shannon airport, dairy farms, cell phone towers, homes, apartment buildings, and fleeing vehicles. Imagine if they flattened several suburbs in Dublin that were sympathetic to Sinn Fein. Imagine if, in the course of the attacks, Britain killed 1,200 Irish people, most of them civilians, one-third of them children. The following story is actually true. I did say this stuff to my friend who narrowly survived the assault, in jest of course. Is there Really Such Thing as an “Illegitimate Target”? A Lebanese friend who lives in California was on vacation in Lebanon visiting his family when the Israeli offensive began. He had to take a dangerous taxi ride out through eastern Lebanon, which was actively being bombed by Israel, to Syria and then Jordan, and from there he flew back to the States. He called me soon after he got back to California. I was immensely relieved to hear from him. We chatted a while in quiet, shocked tones about how unbelievable everything was. I said, “Well, militants might use cell phones, and they might need gas for their cars. So it makes sense that you have to take them out. And militants might use roads and bridges. So you have to destroy them. And militants might eat grain to give them strength to fight. So you have to destroy the grain silos. And militants might need ambulances after they get injured. So you have to hit them, too. In fact, militants might be in any car. So all vehicles are fair game. And militants might be in houses. So you can bomb any house you want. And militants might sit under trees. So the trees have to go. And militants might need to wash their clothes. You can’t allow aid and comfort to the enemy, so you have to hit any washing machines you find behind enemy lines. And UN observers, who even knows what they’re really doing there, or if they have Hezbollah friends? I say take them out. And little old ladies might make mint lemonade for the militants, when otherwise the militants might be too thirsty to fight. So they are legitimate targets, too. “In fact, if you even suggest there is such thing as an illegitimate target, and that Israel is hitting them, you might be trying to discourage Israel, or you might even sympathize with Hezbollah. Here’s another outtake from the book. It couldn’t be included for several reasons, but I’m glad to find a home for it here. I thought of it because a friend of a friend made a crack about reading my book to see how ‘balanced’ it was. Let me pre-empt such talk by saying right now, proudly: My book is not balanced at all, at least not in the sense our media uses when it comes to the Middle East. Unlike most journalists today, I don’t bend over backwards trying to ‘balance’ an apple and an elephant. I simply call it like I see it. (c) that when you have a choice between being ‘balanced’ and telling the truth, it’s better to tell the truth. The following illustrates what I mean by (c). Get ready for a new Scientific American. No more discussions of how science should inform policy. If the government commits blindly to building an anti-ICBM defense system that can’t work as promised, that will waste tens of billions of taxpayers’ dollars and imperil national security, you won’t hear about it from us. If studies suggest that the administration’s antipollution measures would actually increase the dangerous particulates that people breathe during the next two decades, that’s not our concern. No more discussions of how policies affect science either — so what if the budget for the National Science Foundation is slashed? This magazine will be dedicated purely to science, fair and balanced science, and not just the science that scientists say is science. And it will start on April Fools’ Day. This article is about junk science, but it works just as well for junk journalism. No serious person would suggest that Scientific American give equal space to creationism and evolutionary theory. And no serious person should suggest that newspapers print every official statement made by the Israeli government and army without comment regardless of its merit and leave out or downplay the testimony of their victims, so that it sounds like both sides are ‘equally wrong’ (at best). But that’s precisely what our pistol-whipped media does these days. As journalists, maybe we don’t. Maybe our business is to enjoy our job security by deferring to current standards of journalistic orthodoxy. But as human beings, we do. It would have been a crime of omission to be ‘fair and balanced’ about the views of both the powerful and the oppressed regarding issues like Apartheid, slavery, and women’s rights. Inaction and obfuscation favor the powerful, and it escapes me how that can be called ‘balanced’ when time heavily favors the oppressors and justice demands action. And the most basic human action in the service of justice is telling the truth. “Every so often there is a bold crew of Israeli journalists who will film something. One such crew had heard that some of the Israeli soldiers at the Erez checkpoint (Erez is the highly militarized checkpoint which is the sole entry and exit point to the Gaza strip) were playing a game of roulette with the lives of Palestinians. This was a time when a very small number of Palestinians were being allowed to enter Israel through the checkpoint in order to go to work. The gate at the Erez checkpoint is an electric fence, with interlocking ‘teeth’ that make a complete seal, controlled by remote control. The soldiers would play a game to see if they could catch a Palestinian worker in the gate. One worker had died this way. The film crew investigated and filmed the game being played in secret. I used to think CNN was just a shade below God. I lost my blind faith in God when I was 15, but it took until I was 23 to lose all faith in CNN. All it took was a trip to the Middle East. Even religious people will sometimes indulge you in a spirited debate about the existence of God. But when you try to tell ordinary upstanding citizens that Israeli soldiers and settlers deliberately target Palestinian children with outrageous impunity, or that the Israeli government engages in torture and ethnic cleansing, they look at you like you’re a raving lunatic. My personal epiphany came when I was about five. My grandmother had taken me to see some gripping Western. When there was a lapse in the action, I looked down, and there, plain to see, were M&Ms that had melted in my hand. I guess I’ve been a bit of a skeptic ever since. Fast Times in Palestine is a great title! Was it the original title or did it change along the way? I came up with the title almost six years ago, when I first came back from Palestine. I knew I wanted to write a book, and I wanted to target it to mainstream audiences. When this title popped into my head, it struck me as not only fun but also very apt. When I was living in Palestine, there was always too much to absorb, too many great stories, too much beauty and horror. As a friend of mine put it, “The absurd and the sublime, constantly together.” It was just non-stop. So I had the title, but I was terrified because I didn’t know how to write a book. Didn’t even know where to start. And I had to get a job, which sapped all my energy. Still, from that moment, I had the title in mind, and the idea for a novel-like book about Palestine that anyone in America could enjoy and learn from without feeling intimidated. But also without dumbing anything down. The reader learns everything at the same speed and in the same ways I did. I knew nothing at all when I first traveled there. You’ll read in Chapter 1 that I graduated from Stanford with a physics degree, then realized I couldn’t deal with the thought of any more years stuck in a physics lab. I love physics, but doing it as a job wasn’t for me. I didn’t know what else to do, though. I knew I loved to travel and write and study politics and foreign languages, but I didn’t know how to translate that into a job. Basically I wanted to be a writer since I was very young, but in the same way a kid might want to be a professional soccer player. I didn’t think it was realistic. So I bartended for a year and saved money and set off traveling. And I landed in a place whose stories begged to be told. Eight years later, this book is the result. As far as other jobs, I worked as a journalist in Palestine, then I worked as an analyst at a Defense Department think tank in Washington. It was my attempt to try to understand the bowels of Washington, the reality behind the politics, and why our Middle East policies are so screwed up. I learned a lot. But that’s another book! What scene or bit of dialogue in the book are you most proud of and why? My favorite scenes are in the olive groves. I’ve never seen anyone really capture what it’s like to harvest olives in Palestine. It’s a whole different universe, it’s calming and useful and beautiful and funny and… just so hard to describe. But I think I did a pretty good job. Also, there are a few times in the book when I’m afraid for my life. That’s another thing that’s hard to describe, those moments when you’re afraid they may be your last, especially when it’s because of violence or the threat of violence done by weapons paid for by your own tax dollars. That’s really something else. Be honest, how many drafts did you have to write for this book? So many. I would label the drafts A, B, C… and then I’d get to Z and have to start labeling them Z1, Z2, Z3… And then when I’d get it to nearly final form, I’d start over again with A.
I thought I was a pretty good writer before I wrote the book, but writing a book is a completely different world than writing blogs and articles. It’s the difference between building a great sand castle and building a cathedral. There’s a whole structure to it. It’s the hardest thing I’ve ever done, and it took more than three years. It helped that I had a really good and patient literary agent from the very beginning, and several friends who were kind enough to read and comment on it honestly. I had to develop a very thick skin and an instinct for figuring out which constructive criticism would help the project and which to ignore. To put the success of the project ahead of my own ego. There’s something strange about writing a book. After a while, it starts to take on a life on its own, as if there’s a form that already exists and wants to be created. At a certain point you have to get out of the way and not resist what wants to be written, even if it scares you or deviates from your original ideas or doesn’t seem to fit any existing mold. But really the main thing is: be brutally honest. Don’t hide behind pre-conceived notions. Write things as you actually experience them, even if no one’s ever written it that way before. Especially if no one’s ever written it that way before. 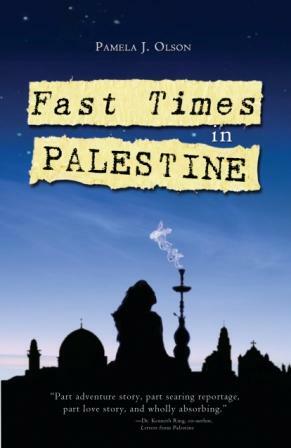 Fast Times in Palestine is available at Amazon.com and other outlets, including the Palestine Online Store (where you can also get delicious Palestinian olive oil). For the month of June, 20% of the profits on all sales of Fast Times in Palestine will go to the US BOAT TO GAZA campaign. The announcement is posted online and pasted below. Please feel free to spread the news! The paperback is $14.95, and the eBook is just $5.99. A book called FAST TIMES IN PALESTINE has just been published, the true story of a young American woman from small-town Oklahoma who stumbles into Palestine and finds her life forever changed. The book chronicles her journey from aimless ex-bartender to Ramallah-based journalist and foreign press coordinator for a Palestinian presidential candidate. How is this relevant to the U.S. BOAT TO GAZA? In two ways. First, the author has agreed to donate 20% of the profits from online book sales to the U.S. BOAT TO GAZA campaign until THE AUDACITY OF HOPE [the American ship in the Freedom Flotilla, which Alice Walker called the “Freedom Ride of our era”] sails in late June. So every copy you buy means more resources for our work in activism, advocacy, and public education. Second, the book was written to appeal to mainstream Americans, yet hit very hard with the truth of what’s happening in Palestine. It’s non-fiction but reads like a gripping novel, with as many laugh-out-loud scenes as there are crushing horrors. It also serves to put the U.S. BOAT TO GAZA in context by explaining the reality of the so-called “Disengagement” (which the author witnessed from inside the Gaza Strip) and the way Gaza has been treated before and after. Its seamless blend of travelogue, memoir, and narrative journalism ramps the average American up to a sophisticated, multi-faceted understanding of the Israel/Palestine conflict. It’s a perfect gift for friends and relatives who can’t imagine why you’re so passionate about Palestine. I got my first hate/attack Review on my book’s Amazon.com page. I’ve reported the guy for abuse — he makes a habit of giving one-star reviews to books about Palestine. Then click “Report abuse” just after it. I guess it’s a point of pride — haters will hate, and it’s better to be abused than ignored because it indicates I might be hitting a nerve — but it’s annoying that my book now shows up with only three stars because of a dishonest review. The book has less to do with Palestine and more with Olson fantasy of the Palestinian narrative. The dinner with the suicide bomber’s family chapter made me puke. Just another foreigner trying to cash in on the juicy stories of Palestinian plight and wars with Israel. She doesn’t even take a stance on anything. It’s very unsettling. I get similar comments — all vitriol, diversion, and racism without any substance — on my blog all the time. I just ignore them. Unfortunately I can’t ignore people who post dishonest nonsense on Amazon.com because it’s a public site that depends on readers to police themselves. After you read the book, it would also be tremendously helpful if you wouldn’t mind posting an honest review on my book’s Amazon.com page to counteract any other dishonest sandbaggers who may show up. After three days, four rolls of packing tape, scores of manila envelopes, fifteen customs forms for twelve different countries, two trips to a computer repair store to bum cardboard boxes, and five heavily-laden four-block trips to the post office with my trusty rolling suitcase, I’m finally out from under all your orders for signed books. Whew! Thanks for ordering so many. It means a lot, and I can’t wait ’til they’re in your hands! Since I last wrote, I went to the Book Bloggers Convention at Book Expo America, and it was fabulous to be in the company of so many great authors and influential bloggers. It was bizarre to see executives from major publishing houses kowtowing to these amateur reviewers. Apparently book blogs move a LOT of books these days. And four of the biggest bloggers seemed interested in my book and each took a copy from me. Who knows if it will make it out of their slush piles (they all have 20-foot stacks of books to wade through at any given time), but nice to have it out there in contention. She named an Israeli settlement. “Um… that’s an Israeli settlement,” I said. I bit my tongue so as not to say, “Yes, that’s why they’re illegal.” I didn’t want to get into it. I didn’t say anything. Honestly, what can you say to something like that? I just gave her a copy of my book and suggested she take a look. Who knows if she’ll ever read it, but maybe the book will at least take a trip to an interesting place, like a Trojan horse infiltrating the deepest dungeons of denial. Or maybe she trashed it on her way out of the building. Whatever. Anyway, I was excited to get an email last week from a bookstore in Baltimore requesting copies of my book, because that very weekend I planned to visit Baltimore! My boyfriend was participating in a Go tournament there. (Go is a Japanese board game with black and white tiles, apparently like chess but harder to master.) I visited the bookstore (Red Emma’s) and delivered my copies by hand, which they paid for with cash. Which I immediately spent on lunch. My official book launch is scheduled for the third week of June, which is exciting. In New York, you’re nobody ‘til you’ve had a book launch party advertised through all the relevant listservs. Should be fun. It’s scheduled to happen just before the next Freedom Flotilla sails, and I think reading the book is a great way for ordinary Americans to get up to speed on why people are so upset about Israel’s policies and why Alice Walker calls the flotilla “the Freedom Ride of our era.” The flotilla will include an American ship called the Audacity of Hope. Let’s hope and pray no one gets hurt this time. Finally, I’ve temporarily dropped the prices on eBooks to $5.99 to build my readership. If you’d like to take advantage of it, and/or spread the promotion around to friends and contacts, please feel free! My website has links to all the ways to buy: http://pamolson.org.